By DJ Salinger, TORONTO – Former Beatle Ringo Starr caused quite a stir when he announced yesterday that he “wrote John’s songs” during his ten year stint as drummer in the world-famous rock group. Starr, 78, was in snow-covered Toronto to promote his new film “Caveman 2”, a just-completed sequel to his 1986 smash “Caveman” – a film made entirely in Aramaic, a full twenty years before Mel Gibson’s “The Passion of the Christ”. Fans of “Caveman” have begged Starr for years to make a sequel in order to tie up unresolved subplots featured in the highly-acclaimed first film. One character, sick of living in a cave, decides to move into a treehouse. The much-talked-about treehouse is never shown in the film. Despite this concern for former band mate feelings, it was apparent to many shoppers in attendance in the cavernous Toronto Eaton Center that the burly ex-Beatle had more on his mind than just promoting his latest prehistoric thriller when he took a break from playing Celebrity Santa to address fans both young and old gathered under a massive fifty-foot Christmas tree. “I knew something was coming; it seems everyone who comes and does Celebrity Santa in Toronto can’t resist turning it into a circus,” said Wendy Jong, an investment banker, who came to the event with her twin daughters Katlin and Flynn. “Somebody ought to write a Master’s on it – ‘The Mythical Connections Between Santa Suits, and Confession,'” she suggested, raising her eyebrows suggestively. Musicologists have known for years that Ringo barely graced the drum throne other than when the band was forced to perform live by their management company BBFun Corp. But the revelation that The Beatles’ most popular member barely wrote at all over the course of their ten-year career set Internet machine tongues a-wagging. 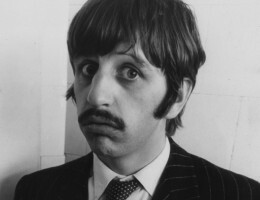 “Ringo, we hardly knew ye,” wrote 26 year-old Travis Hearn, from Glasgow, Scotland on his Vodafone mobular telephone after hearing the news. He sent this message promptly to his mate Hugh Lansing’s MySpace page. Rinko Watanabe, a 17 year-old high school student in Japan, altered the wallpaper of her Internet social networking homepage to include a motif of pink floating hearts and Ringo Starr heads. “‘Ringo’ is ‘apple’ in Japanese,” she said. “I wish I’d written that one,” Starr said. This entry was posted in Thinking Man's Rock and tagged aramaic, canada, caveman 2, christmas, dj salinger, john lennon, mel gibson, ringo starr, ringo wrote john's songs, rinko watanabe, the beatles, the brutal times, Thinking Man's Rock, toronto. Bookmark the permalink. Well that explains all the Japanese kids walking around the Eaton Centre with apples last week. I thought they were protesting pie, what a relief. mr. impossible wouldn’t be at all surprised if Ringo (and not John) was also responsible for all that ‘Paul is dead’ backwards recording shenanigans. For extra Christmas creep-outs, search out the unreleased episode of Thomas the Tank Engine that Ringo recorded entirely in Aramaic. the information about japan is laden with erroneous thinking. please report to the consul immediately.